2018 CONFERENCE REPORTKeeping you in the loop! The AGM saw Tony Page elected as President and Peter King elected as Alpine Region Representative and Aaron Pearce elected as Lakes Region Representative. All other Executive positions remained unchanged. 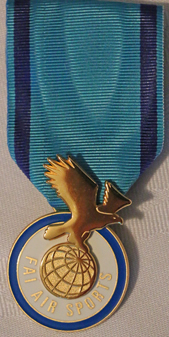 At the Friday evening Presentation Dinner, the prestigious FAI Air Sport Medal was presented to Doug Yarrall of Wairarapa, Jim Fraser from Auckland and Paul Drake from Canterbury. 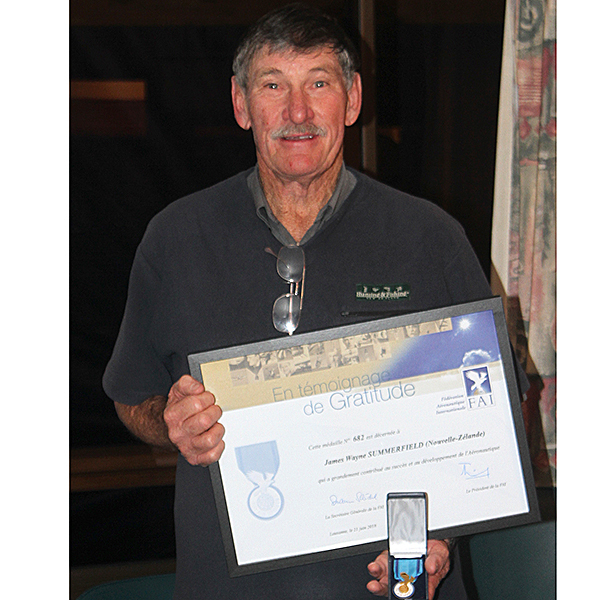 A fourth recipient Jim Summerfield from Kaitaia, was presented his Air Sport Medal on August 4th. The theme of this year's conference was "Keeping you in the loop", and covered a wide range of topics. The Past President, Rob George, opened the Conference, welcoming all present and spoke of what had been achieved in the past 12 months. After a FAI update presented by Liz King, Mark Woodhouse of Waypoints Aviation launched the new Flying NZ/Waypoints examination bank. Both mock examinations for all Pilot examinations and the full Microlight Pilot examinations (Operational Knowledge and Technical Knowledge) are available on the Waypoints web site. https://www.waypoints.nz For further information see below. 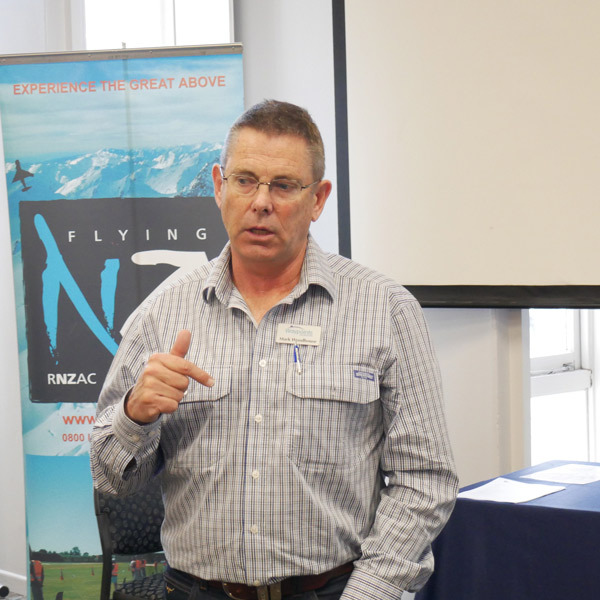 This was followed by Instructor Council members Daryl Gillett and Shaun Sutherland speaking about the further development of the Flying NZ 149 certificate and its application. Arden Jennings of Avsure spoke about the changing needs of aviation insurance and the growth demands upon airlines with the quickly developing pilot shortage. Wayne Blythe from Airways, gave a comprehensive update on the New Southern Skys Programme, details below. The afternoon session commenced with Steve Moore Deputy Director GA of CAA speaking about CAA's new Regulatory Craft Program. Steve also spoke about the possibility that a commercial drivers licence medical may well replace the Class 2 medical for the PPL licence. He concluded his talk speaking about the proliferation of drones of various types and steps being taken to safely integrate them. 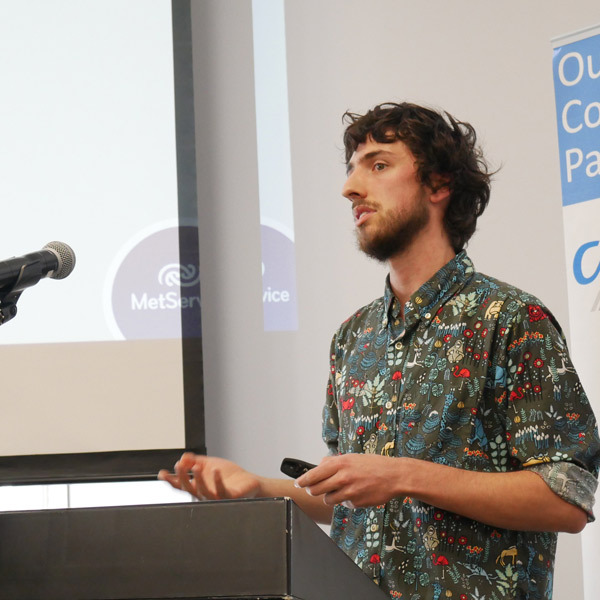 Tui McInnes from the Wellington Met Service	gave step	by	step guidance through GRAFOR, the Met Service's Low Level Graphical Aviation Forecast system. Tony Page and Paul Drake gave a short update on the Competition Rules changes	for	the	2018/2019	competition	season. Flying NZ Webmaster Ian Kirkpatrick discussed the relationship between social media and a web site, and gave a presentation on maximising the effectiveness of a web site as a promotional and marketing tool. In a less formal style, Rob George interviewed Raylene Wadsworth of the Marlborough Aero Club to explore the reasons for the Club's long term success as relatively large club operating in a small comunity. It was disclosed that the real reason was the high value placed on both current and prospective members and a warm welcoming environment for all. David Saunders gave an update on Young Eagles and why clubs that have not yet joined the scheme should do so. He outlined the benefits that it had provided at North Shore, not only to the young Eagles, but to the club. The conference was closed by Tony Page. 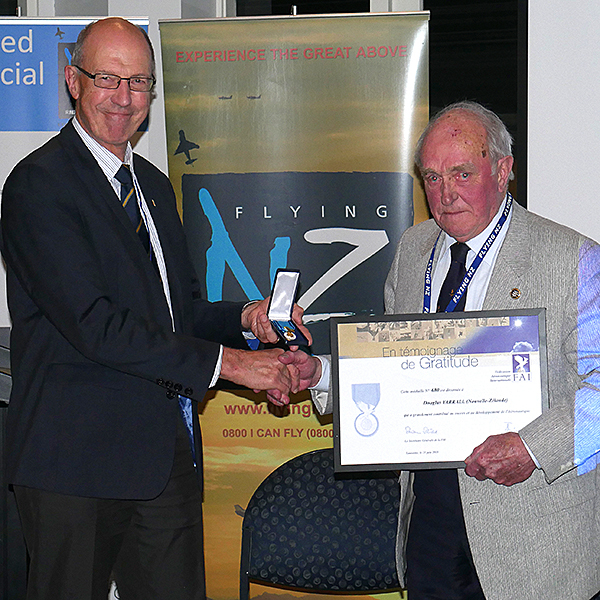 Paul Drake was presented with an FAI Air Sport Medal at the Flying NZ AGM/Conference Dinner on Friday 20th July 2018. Paul Drake is a man who has lived out a declaration he made as a 10-year-old that one day he would be, as was his father, a private pilot! In his first year of secondary education at the Timaru Boys High School, he joined No. 15 Squadron of the Air Training Corps, and at the age of 15 he was selected with another cadet to undertake initial training as a pilot at the annual ATC training camp at Matamata. At the conclusion of the camp he joined the South Canterbury Aero Club, paying the flying fees with his earnings as a week-end baggage loader for the Mt Cook and Southern Lakes Tourist Company DC3 service in and out of the Timaru Airport. He had only just turned 16 in September 1974 when he made his first solo flight. At the same time, he played a leading role in the ATC (as a sergeant) and its branch at the Timaru Boys High School. This activity saw him reach a decision to try to work as an air traffic controller, but his first application was declined on the grounds of his youth. After another year, he renewed his application, and early in 1977 he entered the Civil Aviation’s college at Harewood to train in flight service operations. After serving at Wellington for several months he lodged a second application for training in air traffic control. This was upheld, and he subsequently returned to the Christchurch training school. Following his graduation, he served at Invercargill and Dunedin and, from early 1987, at Christchurch. While he was highly regarded by his peers, he chose to leave his profession for personal reasons after a total of 21 years, and, subsequently, took a position with the Christchurch Airport branch of Civil Aviation’s Aviation Security Service. He qualified in several aspects of his work, and held senior rank for several years. As to his flying activity, he qualified in his early days for both a private pilot’s licence and commercial licence, with a C Catergory instructor’s rating, and over the years he twice won the New Zealand Navigation trophy and the commercial pilots’ low flying competition. Throughout his long association with both Air Traffic Control and the Aviation Security Service he took a very special interest in serving both the Canterbury Aero Club and the Royal New Zealand Aero Club in an executive role. Eventually, he rose to the rank of CAC president, a position he held for eight years until 2017. His link with the RNZAC (now Flying New Zealand) has encompassed some 16 years in two segments, and in both periods he rose to the rank of senior vice-president. At the same time he played a significant role as a safety officer, assistant ground judge, chief ground judge, at the annual flying competitions held around New Zealand including recently be involved with the WINGS Trans Tasman New Zealand Team selection. 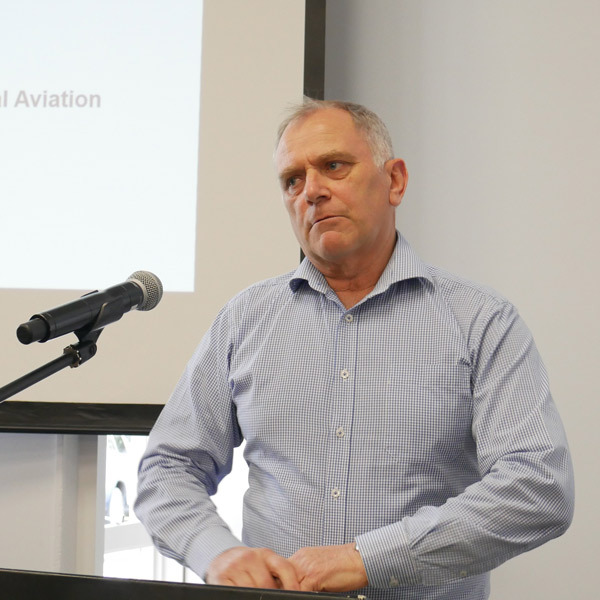 He has represented the RNZAC for several years on the Civil Aviation Department’s special safety committee which meets in Wellington regularly. At the first meeting following his department from the Aviation Security service he was elevated to the position of chairman. 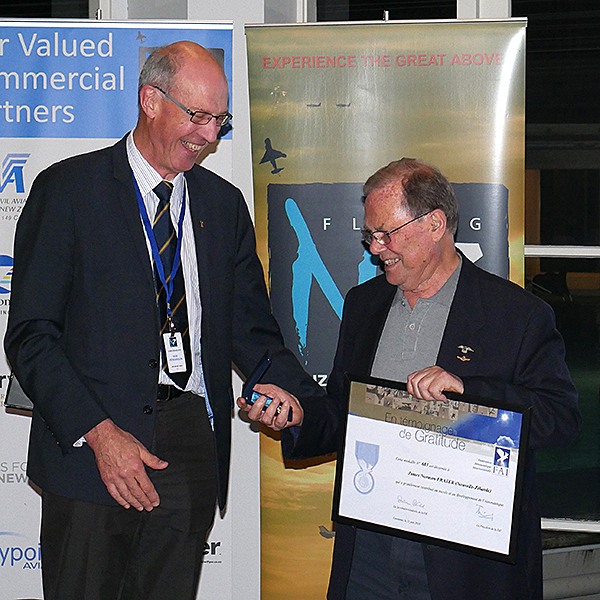 Jim Fraser was presented with an FAI Air Sport Award at the Flying NZ AGM/Conference Presentation Dinner on Friday 20th July 2018. Jim started flying as a cadet with the Air Force where he went solo flying Tiger Moths in 1955. Jim then went on to train and graduate as a pharmacist and when he moved to Edgecombe in the Bay of Plenty to open a pharmacy shop in the early 1960`s, he joined the Rotorua Aero Club flying mainly out of Kawerau and Whakatane. He joined the Auckland Aero Club at Ardmore in January 1969. During his time flying he rated onto some 17 aircraft including the Tiger Moth DH82, Victor 100, Cessna 172, Cessna 152, Cessna 162, Victor 130, Victor 159, Grumman AAIC Grumman Tiger, Tobago, Cherokee 6, Piper Archer, and Emeraude to mention some. He has served on the committee of the Auckland Aero Club on two occasions initially with President Ross Dawson for some 4 to 5 years and more recently for some 9 years He is a very active club member and until recently would always be available to help with working bees. He jointly took responsibility for mowing the club grounds and associated taxiways and parking areas for some 10 years. This was in retrospect quite a commitment taking upto 3 hours weekly to do. He has been a very active member at Club Regional and National competitions. He has competed in the Nationals no less than 20 times including formation, bombing, Ivon Warmington life raft, streamer cutting, Wigram senior landing and Sir Francis Boys precision landing, and GM Spence forced landing. He won the Wigram Senior landing in Ashburton in 2001, the Ivan Warmington Life raft drop in Palmerston North in 2002, the Francis Boys precision circuit and landing West Melton 2011 anf Forced Landing North Shore 2012. 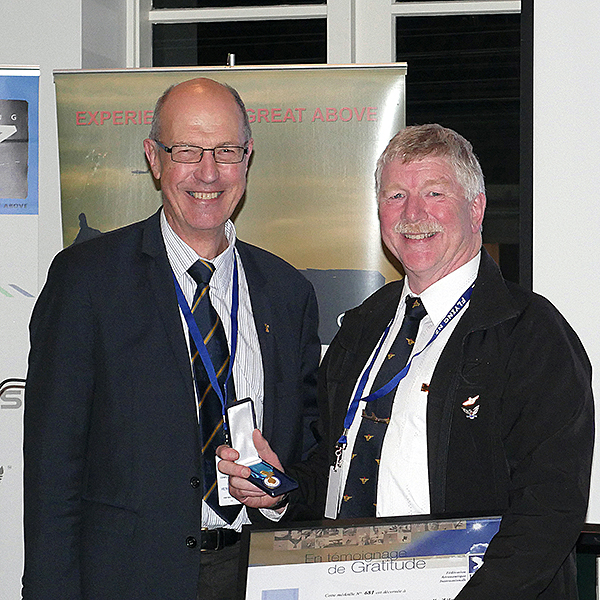 Finally he is a life member of the Auckland Aero Club and continues to be passionate about both its and Flying NZ`s survival. Doug Yarrall was presented with an FAI Air Sport Medal at the Flying NZ Presentation Dinner on Friday 20th July 2018. Doug has had many years involvement in NZ aviation starting in 1958 with both Gliding and Power flying, doing his first flight in a glider in 1958 and gaining his Private Pilots Licence (PPL) the same year. The two disciplines intertwined through the years nicely. In the powered flying world Doug is perhaps best known for being the CFI at Wairarapa Aero Club from 2009 to 2017. Doug converted to mico light flying in 2008 after 50 years of many type ratings from Cessna to Mooney to Auster to Piper multi, with a glider tow rating gained in a DH82 in 1960. He was made a Life Member of the Gliding Club in 1962 and the Wairarapa Aero Club in 1984. Doug has always supported and encouraged people both young and not so young in their aviation endeavours. Doug's nomination is supported by Gliding New Zealand and the Recreational Aircraft Association of New Zealand. If anyone was born to fly it was Jim Summerfield. At the age of nine he saw a topdressing aircraft working and decided that was what he was going to do. As a teenager he gained his PPL in 1967 with Kaitaia Aero Club (Inc.). In the 1970s, having gained his CPL, Jim took his turn flying Holiday Safety Patrols, along with charter, scenic and emergency “Air Ambulance” flights for the local hospital under the commercial arm of KAC. Of course, Jim did not forget his dream and during this time also took up his first top-dressing job – work he retired from just a few years ago. BUT he continued to do all he could for the Club. As KAC was reliant on Flight Instructors visiting from other Clubs, in 1988 Jim gained his Flight Instructor rating thus becoming the Club’s resident Instructor – as he still is today. His expectations of his many Students have been to maintain a professional attitude, manner and dress, whether training to just go solo, for a PPL or a CPL. “If the standard required is here, you aim for there” he would say. (a notch higher of course) One Pilot remembers Jim as he with the shiny shoes and said it was always good being taught by him as he explained things making them easy to understand. Jim has always first and foremost been strong on safety in aviation, in his own words “I teach to stay alive”. If a Club Pilot is a bit unsure of something Jim does not hesitate to offer to go for a fly ‘I’ll just sit with you, no charge’, to iron that something out. He has always been available should anyone have a problem they wish to discuss, whether they be a local Pilot or someone from further afield and has helped out with Instructing for other than KAC when asked. Jim has always been prepared to go the extra distance to make someone a better pilot. Jim has been behind various projects over the years, whether it be encouraging Club Pilots to participate in Competitions, try something new like beach landings, or take Club trips away. Kaitaia is rather out on a limb so that can be a difficult decision for some. In bygone years Jim was always trying to organise inter-club activities when there were much stronger clubs in the surrounding area, even getting the Warbirds to Kaitaia for an overnight stay. In the late 1980s Jim was also behind KAC building new premises getting members enthusiastic about fund-raising then literally building it themselves, no mean feat on either front!! In his view it would add more to the professional image of the Club, after all it was then operating out of the old control tower, known as “The Rats’ Nest”. All this he has done whilst working in with his top-dressing. He has amassed over 22,000 hrs to date, which, with the job he did, imagine how many take-offs and landings there would be in that! Jim has been the mainstay of Kaitaia Aero Club for many years. What is the saying – he has forgotten more than we know? Except he hasn’t forgotten it at all if it is about flying! !